4Free Registry Cleaner can locate and correct problems in the Windows registry, such as missing references to shared DLLs, unused registration entries for file extensions, and missing referenced application paths. 4Free Registry Cleaner can also mark the registry items which are safe to remove as well as those which are not advisable to remove. And it will automatically back up the deleted registry. It supports a manual backup for the whole registry before running operations. In essence, this product is safer than other registry tools. 4Free Registry Cleaner also allows users to delete system restore points. 4Free Registry Cleaner can help you optimize your system parameters to let your Windows run faster. 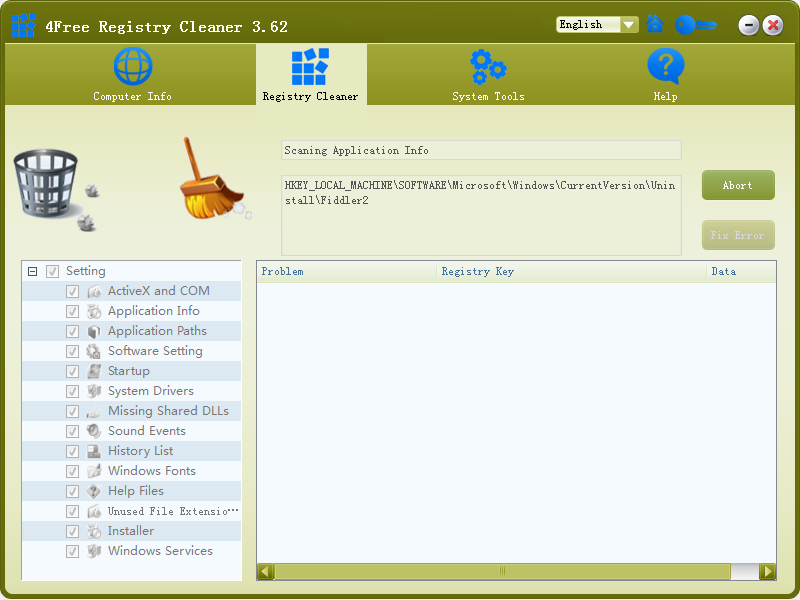 4Free Registry Cleaner provides you with the function of physically defragmenting your registry files. And this defragmentation can reduce application response time and registry access time. 4Free Registry Cleaner can provide you with a quick and customized scan over your system and present you with a list of registry errors information and proposed solution for you to consult. you can restore or customize your IE settings, such as homepage, right-click context menu, Window title, etc.